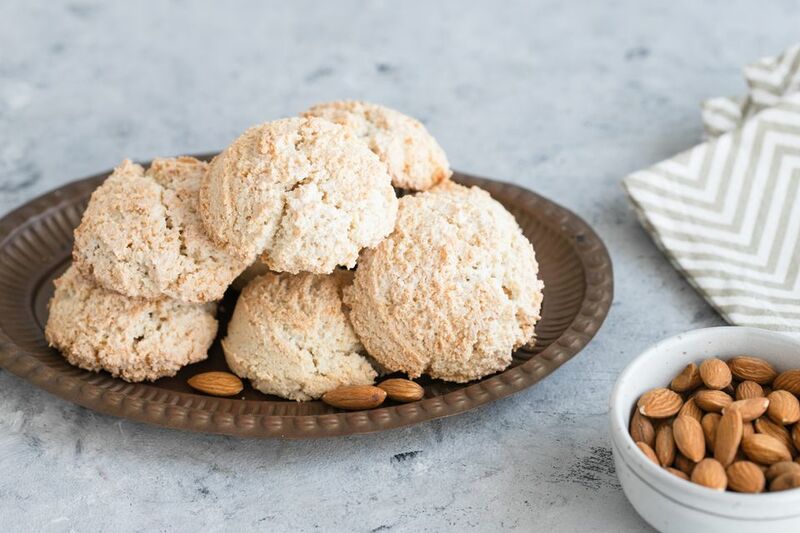 This Polish almond cookie or amaretti (ah-mah-RRET-tee) is a flourless treat that comes together quickly. In the past, people with gluten issues had to forego things like bread, cakes, cookies and other items containing wheat. But thanks to recipes that use ground nuts in place of flour, and significant improvements in gluten-free flour products, those following a gluten-free way of life don't have to feel deprived anymore. After all, partaking of food (in moderation, of course) with family and friends is a celebration of life and many Eastern European customs are centered around ritual bread and baked goods. Not all recipes work out by making a one-to-one conversion of all-purpose wheat flour to all-purpose gluten-free flour, so it might take some experimentation. Note: while there are multiple steps to this recipe, these cookies are broken down into workable categories to help you better plan for preparation and cooking. In a medium bowl, whip the 2 large room-temperature egg whites until they are stiff. Gradually add the sugar while continuing to whip. The meringue should be so stiff, you can cut it with a knife. In a separate large bowl, mix together the ground almonds with the sugar, almond oil, and a pinch of cinnamon. Stir in a dollop of the meringue to lighten the nut mixture. Gently fold in the remaining meringue, trying not to deflate the volume. Using a scoop, drop equal portions of cookie batter onto the prepared pan. Bake about 15 minutes or until cookie bottoms are lightly brown and the tops are crackly. This is a traditional Polish Christmas cookie that is made with 2 egg whites. With the leftover egg yolks, make Polish Egg Brandy, which is similar to eggnog, or freeze the egg yolks for yolks-only recipes like these. The cookies can be stored in a tightly covered container.